Shabaab, al Qaeda’s affiliate in Somalia, killed one French commando and captured another during a failed French attempt to rescue Denis Allex, an intelligence operative who has been in the terror group’s custody since 2009. Allex and Marc Aubriere, two DGSE agents, were captured in July 2009 at a hotel in Mogadishu. Both men were posing as journalists and trainers for the Somali military. Aubriere escaped under mysterious circumstances and it is rumored the French government paid a ransom for his release. Today the French Defense Ministry confirmed that one of its soldiers was killed and another was captured, and that 17 Shabaab fighters were killed during the early morning raid, France24 reported. French officials said they now believe that Allex is dead, but would not provide further details of the raid. The raid was carried out by the General Directorate for External Security (DGSE), the Defense Ministry’s external intelligence and paramilitary force. Shabaab denied reports that Allex was killed in the raid, in an official statement released on its Twitter site, @HSMPress (Harakat Al-Shabaab Al Mujahideen Press Office). The statement also provided additional details on the raid and confirmed that Shabaab captured a French soldier. “At around 0200 hours Saturday morning five French helicopters attacked a location in the town of Bula-Marer, around 30 km South of Marka in the Islamic Administration of Lower Shabeelle, in a botched rescue attempt aimed at releasing the French hostage Dennis Allex,” Shabaab said. Shabaab said it has warned the French in the past not to attempt to rescue Allex, and then issued an ominous statement that indicated the group may execute him. 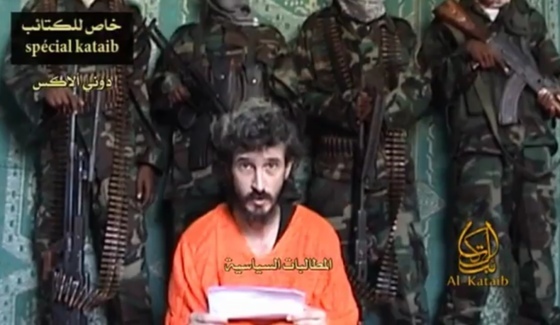 “As a response to this botched rescue operation by the French forces, Harakat Al-Shabaab Al-Mujahideen assures the French people that it will give its final verdict regarding the fate of Dennis Allex within two days,” the statement concluded. France’s failed rescue mission in Somalia took place just one day after President François Hollande announced that the military would intervene in Mali as three al Qaeda-linked jihadist groups are advancing southward. French forces launched an airstrike in central Mali yesterday, and European soldiers were seen disembarking from an airplane in Sevare, near the city of Mopti. French citizens have been advised to leave Mali. The rescue mission in Somalia was attempted as France feared Shabaab would execute Allex due to the French intervention in Mali.